For leading a healthy and wholesome life, both, physically and mentally healthy lifestyle and diet form an integral part of it. Therefore, knowing which food items are most beneficial for the growth and maintenance of good health of certain body parts is important. Let’s know about the body muscles and natural foods that help to maintain your muscle health. Muscles play a vital role in the fitness of the body. Muscles provide support to the skeletal system of the body. If the body muscles are unhealthy it largely affects body postures. 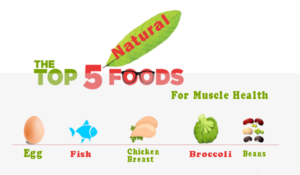 Hence, it is necessary to keep the muscles in healthy condition by eating natural foods that promote good muscle health. Building muscle mass is usually mistaken with burning, which is not true. EGGS- Eggs are the rich natural source of minerals and protein and is therefore a versatile natural food item. Breakfast should always be completed with eggs and milk. They tremendously contribute in building good muscular health. Protein is an essential element in the muscle building process. Egg white is the one of the best source of protein and amino acids in natural food. Whereas egg as a whole contain (egg white and yolk) contain zinc, calcium and vitamins such as vitamins A, E and K. Eggs are easy to be digested too and contribute to a balanced diet. FISH- Fish is a highly rich source of omega-3 and protein that are required for muscles of the body. Most commonly Salmon is consumed because of its high quality protein and omega-3 in abundance. Omega-3 serves a crucial purpose in muscle health and also improves muscle gains during exercise sessions. Along with other body muscles Salmon also improves the health of heart and serves as resistant in the process of breaking down of muscles. Bones are also made stronger by including fish in your regular diet. It serves dual functions thereby making the entire body stronger. CHICKEN BREAST– It is also from animal source like the above two foods and source of complete protein. The low amount of saturated fat makes this much more favorable natural food for maintain good muscle health. It is enriched with great amounts of B vitamins niacin and vitamin B6. Chicken is white meat which has very low amount of fats as compared to red meat. This is what makes it one of the most common good muscle-building natural food for the body. BROCCOLI- Broccoli is an amazing source of zinc that helps in the synthesis of protein in the body. It is also a major source of fiber. Other members of the Brassica family such as Spinach and Cabbage also have similar properties. Broccoli especially is a super natural food that fights off fat storage and helps in lowering stress hormone level. BEANS- Beans not only contain protein required for sustaining muscle health but are also high in fiber, B vitamins, iron and magnesium. Beans make a unique plant based protein valuable for health. These are some highly nutritious and easily available natural foods that are certainly high in protein and other nutrients that are essential for overall good muscular health. With these options you can still eat good and have healthy muscles. If you want to read more of such interesting informative articles that satisfy your curiosity then surely go ahead and subscribe for our eating naturally magazine at maggstore.